A Monster Ate My Homework is a gaming app that celebrates homework and deplores monsters. The game was developed by Geek Beach Ltd. for an iPhone, iPod Touch, and iPad. The app costs $0.99 and is similar to Angry Birds. The game starts with a cardboard box, and a stack of books and a monster sitting on top of it. The monster is a green box with an evil face. 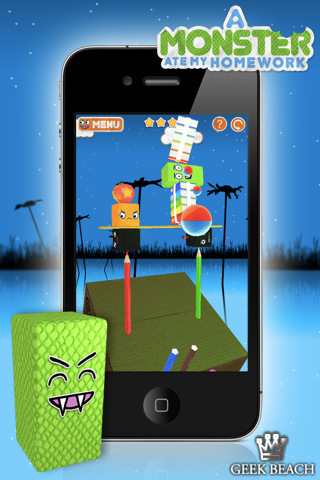 The app is a physics based game with an accurate 3 dimensional rendering of stacks of homework and box monsters being pelted with rubber balls. The goal is to knock the monsters off your cardboard box and into the pond, while keeping all of your homework stacks on the box and out of the water. As easy as the endeavor sounds, the game proves to be mildly addicting as you find it can be a challenge to rid your precious homework of those pesky monsters. As the levels progress, you are confronted with an array of different setups that make it increasingly more difficult to separate the wheat from the chaff. If you find that you have misfired a shot and sent a stack of your homework flying off in the direction of the pond, then you can try to spin your 3D view around fast enough to fire one of your balls in an effort to corral your homework back onto the box. 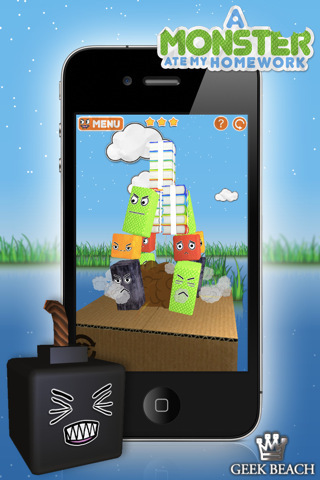 In each level, you are provided with 3 stacks of homework and varying numbers of monsters. You score up to 3 stars based on how many stacks of homework you are able to keep on the box. Later challenge yourself by reducing the number of shots you fire to complete the levels while attaining 3 stars. More challenging zones can be unlocked by gaining a prerequisite number of accomplishment stars. At first while playing this game, I did not officially grasp the sensitivity required to ace every level, but instead I was mainly humored by the variety of stupid expressions that the monsters make in an effort to taunt. With a little bit of practice, I found there actually was a degree of skill involved if one is to advance to the next zone. Although fun, it is not nearly as extensive or habit forming as Angry Birds, but it is still a good follow up for any avid fan. AppSafari review of A Monster Ate My Homework was written by Vanessa Paszterko on December 29th, 2010 and categorized under App Store, Fun, Games, Physics Based, Strategy. Page viewed 4185 times, 1 so far today. Need help on using these apps? Please read the Help Page.